Knesset House Committee chairman Yariv Levin charges DM Ehud Barak's bureau is interfering with Knesset prerogatives. 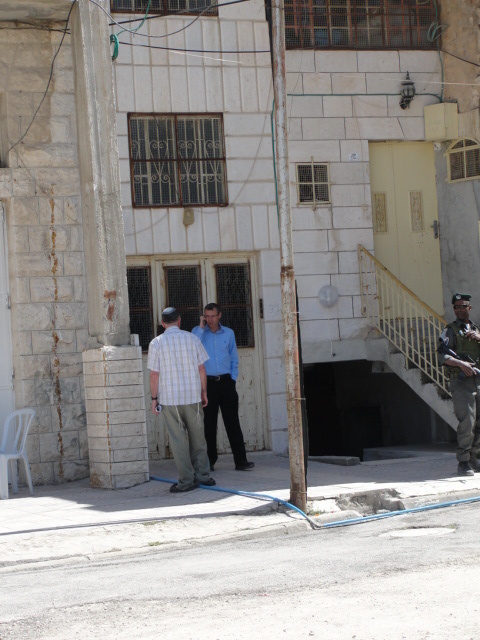 MK Yariv Levin was allowed to vist Beit Hamachpela (House of the Patriarchs) in Hebron on Monday only after battling with Defense Ministry officials to exercise his perogative as a lawmaker. "The attempt to thwart my visit to the Patriarchs is a violation of Knesset working authority," Levin, who chairs the Knesset House Committee, said. MK Levin visited the tent city near the house from which 15 Jewish families were evicted using a legal technicality shortly before the holiday of Passover began. "The Patriarchs residents were evicted from their home two weeks ago, a period which no doubt was long enough to test the legality of the acquisition structure," Levin said. MK Miri Regev (Likud) is expected to visit the tent city tomorrow. Defense Minister Ehud Barak ordered the families evicted the night after having reached an agreement with Prime Minister Binyamin Netanyahu, Minister of Strategic Affairs Moshe Yaalon, and Minister without Portfolio Benny Begin to wait until after Passover. The government had intended to use the intervening weeks to establish the "legal facts of the case." Barak did not assert the sale was invalid when moving to evict the families. Rather, he based the order on the fact that the IDF Civil Administration had not validated the sale. The families say they did not wait because they were afraid Arab squatters would take up residence in the building in the interim, saying that the straightforward process of sale validation often drags out for months under Defense Minister Ehud Barak. Barak's decision to evict the families was roundly criticized by the Likud-led ruling coalition, and led to numerous calls for his removal by Netanyahu. Meanwhile, it was reported this week that the Palestinian Authority sentenced the Arab who brokered the purchase of Beit Hamachpela to the Jewish families, Muhammad Abu Sehaleh, to death. Following sentencing, David Wilder and Noam Arnon of Hevron's Jewish dashed off a letter to UN Secretary General Ban Ki-Moon saying, "It is shocking to think that selling property to Jews remains somewhere in the world a crime that is punishable by death." "The fact that this law exists in any legal system indicates a distorted and barbaric notion of the term 'Justice,' and is reminiscent of the legal systems of the Middle Ages. "We appeal to all international leaders to demand the abolition of the death sentence pending against Muhammad Abu Sehaleh, and to also demand his immediate release from prison. "He did not commit any crime," they wrote. Sehaleh's sentence must be signed by PA chairman Mahmoud Abbas before it is carried out.